The smartest sit-com of all time" - Arena. 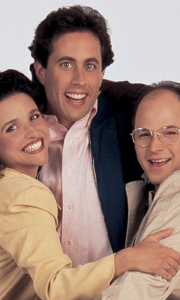 Seinfeld Season 4.Special Features The Breakthrough Season: An In-Depth, Behind-The-Scenes Look At The Emmy- Winning Season In Seinfeld Leapt From Cult Favourite To Ratings Sensation And Officially Become 'A Show About Nothing. ', Notes About Nothing: Behind-The-Scenes Scoop And Production Notes, Inside Looks: The Cast And Creators Talk About What Was Happening Behind The Scenes Of Certain Epi..
"... the greatest US comedy." - GQ. Emmy Award-Winning Season! Includes "The Big Salad," "The Jimmy," "The Face Painter"Special Features Approximately 13 hours of exclusive special features from the creative talents behind the show, including all-new interviews with Jerry Seinfeld, Larry David, Julia Louis-Dreyfus, Michael Richards, Jason Alexander and more!, Running With The Egg: Makng A Seinfeld: Join the cast and crew of Seinfeld a..
"One of the best comedy shows in history" - LoadedSpecial Features Approximately 13 hours of exclusive special features from the creative talents behind the show, including all-new interviews with Jerry Seinfeld, Larry David, Julia Louis-Dreyfus, Michael Richards and Jason Alexander!, Jerry Seinfeld: Submarine Captain: You know him as 'Master of his Domain'; now in a behind-the-scenes documentary, dive beneath the surface to see how J..
"The smartest sit-com of all time" - ArenaSpecial Features How It Began: An Hour-Long Look At How Jerry Seinfeld And Larry David First Came Up With The Idea For The Show, How It Almost Didn't Get Made And How They Emerged With The Show That Changed The Face Of Television Forever, Notes About Nothing: Behind-The-Scenes Scoop And Production Notes, Inside Looks: The Cast And Creators Talk About What Was Happening Behind The Scenes Of Cer..
"The smartest sit-com of all time" - ArenaSpecial Features Approximately 13 Hours Of Exclusive Special Features From The Creative Talents Behind The Show, Including All-New Interviews Jerry Seinfeld, Larry David, Julia Louis-Dreyfus, Michael Richards, Jason Alexander And More!, Kramer Vs Kramer:Kenny To Cosmo: If You Thought Cosmo Kramer Was Hilarious, Wait Until You Meet The Real Kramer...Kenny Kramer!, Notes About Nothing: Behind-Th..
Seinfeld Season 9 "ever-popular and universally acclaimed" "all the more outrageous for being so funny"Special Features Approximately 13 hours of exclusive special features from the creative talents behind the show, including all-new interviews with Jerry Seinfeld, Larry David, Julia Louis-Dreyfus, Michael Richards and Jason Alexander!, The Last Lap: The cast and crew reminisce about their final days making Seinfeld and share their im..
Own Seinfeld Seasons 1 to 9 Complete Collection DVD from Deff, DVD, Blu-Ray & 4K Video Specialists - Free UK Delivery..